Learn from top agents the most important tips for your listing presentation. Real estate agents - do you want to learn key tips and industry best practices for listing presentations from the best of the best? In today’s market where real estate listings are flying off the shelf, one of the most important skills is to nail the listing presentation. That's why we’ve gathered some of the top realtors from around the country who have the highest transaction volume in their market to share how and why the present the information they do during their listing presentations. After all, who who better to give you advice on how to win a listing than someone that is in the trenches giving listing presentations every day getting it done. 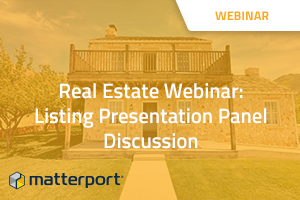 Watch our on demand panel-style webinar to hear firsthand how top agents and broker from across the country prepare and execute their listing presentations. Our speakers will share their expertise and style and what new agents need to know before going into their first listing presentation. If you could win more listings, you’re almost guaranteed commissions. Learn how to get started today. Our real estate listing presentation panel includes agents and brokers who are number one in their market in Chicago, Alabama, Ohio, and Washington. The Amy Kite team is in the top 200 of teams in the country by transactions and ranked #10 in Illinois. Preparing a proper competitive market analysis is key. Study the neighborhood and don’t be afraid to ask other people in your office if they are familiar with the area. Focus on your negotiating skills and your service to the client in your next listing presentation. Learn from other agents who negotiate against you, and find some local classes on negotiating. If you’re part of a team, you can leverage the fact that there are many people working together to get them the best offer possible. And if you’re not part of a team, you can still position that as a positive. You’re the one sole point of contact, you’re the person they are relying on and they feel like they know you personally. Anthony Colantuono is part of the #1 team for Coldwell Banker Schmidt Family of Companies in Ohio. Leverage the brand and the tools available to you from your brokerage. Coldwell Banker has a proprietary CBX where some of my pricing comes from. It’s a cool tool that helps with pricing of a home. We can target market buyers with that. Speak to your ability to broadly distribute a home to remote buyers. With Matterport, we’re closing more deals than ever because we’re able to send all of our listings at once. You have to be able to speak with confidence and authority. If you’re a new agent without the sales history, you have to say “us” as a company and leverage your company’s background. Home sellers respond to the most and are intrigued by the marketing. They couldn’t care less about you or your history, they care that you are a professional with a proven track record, and you’re going to take care of their need which is to sell the house. The most important thing an agent should do is listen. We are there to serve, hear their timeline, their reason for selling, and what they care about. Lead with the best marketing tools you have available to you. Our marketing is unparalleled to everyone else in our marketplace because we use tools like Matterport. The Tomlinson Real Estate Group is comprised of 800 agents across 18 offices, under 3 separate franchises including Coldwell Banker, Century21 and Sotheby’s International Realty. I always have a collection of Matterport tours from my companies on my iPhone and iPad, because I find myself having impromptu presentations all the time. Whether it’s in line at TSA, at my local watering hole, or sitting next to someone on a long flight, I am always ready to give my pitch with Matterport. Use new technology to engage your audience. Matterport is still new enough and novel enough that chances are the consumer hasn’t seen it and you will be the only agent presenting it. There’s never been a better time to be in real estate than right now. The next 5 years will be amazing for agents who are adaptive to change. To hear about more tips and tricks, watch our on demand webinar today!